The Panasonic KX-TDA50G is compatible with the all of the KX-T 7000 series phones as long the proper extension card is installed although the Panasonic KX-TDA50G will work best and be most cost effective with the KX-T7600 series phones and the KX-DT phones. Some of the Panasonic KX-TDA features include: Caller ID, Call Logging, Call Conferencing, Account Codes, Direct Inward System Access, Call Forwarding, Speed Dial, Door Phones, Wireless Telephones, and PC Programming. Starter Kits and system bundles that include three phones with four lines to starter kits that include 10 phones and four incoming lines with available features like voice mail and cordless phones. The Panasonic KX-TDA50 PC Admin enables programming of the Panasonic KX-TDA50 via a Windows XP, Vista, or Window 7 PC. A USB cable is required to connect to the phone system unless an IP Gateway card is installed in the Panasonic KX-TDA50. 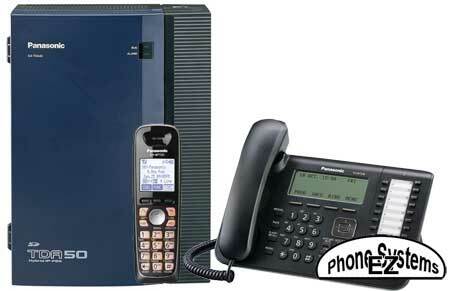 Some of the features that need to be programmed are EZ to figure out if the person programming the phone system has good computer skills and some features are harder to figure out as the terms Panasonic uses to program these features are not known. The Panasonic KX-TDA50 has many different expansion cards available for digital phones, analog phones or a fax machine, VoIP phones for off-site extensions, existing KX-T7000 or KX-T7700 series phones for upgrading from a Panasonic KX-TA phone system, and CO/Trunk cards for the expansion of incoming lines. Voice Over IP can configured in two ways. One is for what is known as VoIP Phones for off-site extensions at a home and We can connect several KX-TDA50 phone systems in separate locations either across town or hundreds of miles away together with an existing internet connection although an advanced high speed inter connection with a VPN is required. For associates on the move lets say in a hotel room it is best to use what is known as a soft phone as networking of computers and phones is not available in a hotel room also beware in lower end hotels, all they do is provide an internet connection, the VoIP ports are not open and they do not know how to open them so a VoIP phone will not work. Integrating the 2.4 GHz Multi-Cell wireless telephones with the KX-TDA50 means that the benefits of your phone system can follow you where ever you are on your premises. 28 wireless hand sets can be used on one system, 8 in use at one time, wireless hand sets can be used on multi systems, caller ID compatible, programmable ringer type, and access to system speed dials. Multi cell site capability means the Panasonic KX-TDA50 can wire less cell sites mounted or located around a large facility or warehouse and when a cell phone user moves away from one cell site the wireless phone will then connect to the next closest cell site just like a cell phone. 2 systems more expandable than the KX-TVS line to meet the needs of growing business with out the sacrifice. The KX-TVS50 starts out at a 2-port interface X 2 hour storage with expansion to 6-port interface X 8-hours storage. Flexibility is the key with any telephone system. The system software and local database information are stored permanently on the removable Panasonic SD Card. If for some reason the KX-TDA50 suffers a system failure. all system software and setting are saved for reinstallation. Call one of our experienced sales representatives and give us just two minutes of your time or fill out our online request a quote form. Find out how EZ installation of the Panasonic KX-TDA50 can be? With our EZ Installation cable and block wiring kit. E System Sales, Inc provides what is known as an EZ Install Cable & Block kit so all you have to do is run wires from your existing 66 blocks to our EZ install cable & block kit. E System Sales is one of the nation's largest Telecommunication Phone Systems, and Security Camera Systems distributors. We are working with our suppliers to bring our customers the best prices, quality and service. We are working every day with our suppliers to bring you our customers and clients the best pricing and unlimited technical support available on a day to day basis. We appreciate the chance to bid on your next system project.